Linden, New Jersey, is home to just over 40,000 people in southeastern Union County. 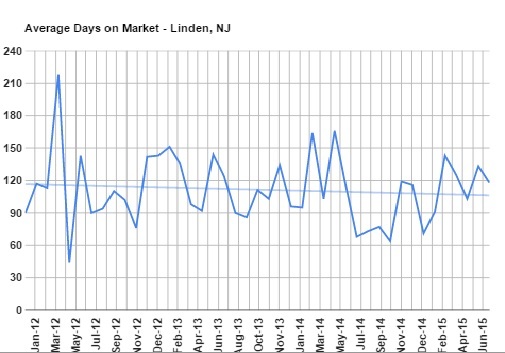 Before a buyer or seller begins a real estate transaction in Linden, the first step is to understand how the local real estate market is behaving. Before you list your home for sale, you need an accurate picture of how much it is worth. Before you begin looking at houses to buy in Linden, it’s important to know how much house you can afford. Sales: Currently there are 300 homes offered for sale in Linden. The trend line for that past 3 years shows practically no change in inventory. There were 25 homes sold in Linden in August. The trend line over the past 3 years also shows no change in sales. Since real estate is often a function of supply and demand, it’s important to note that the same number of homes are listed every month as are actually sold. Prices: The average sale price of a home sold in Linden in August was $231,081. Home prices have been increasing for several years. Lower mortgage rates and an increasing economy have helped boost prices in Linden even though the inventory remains high. Days on Market: People who are selling their house often have anxiety about maintaining their home in show-ready condition. Being constantly ready for a showing is stressful and most home sellers are eager to sell quickly – not only to relieve the anxiety of being on the market, but also to help them get to the next stage in their lives. Therefore, Days on Market can be an indicator of how long an average home will take from the day it is listed until the day it sells. In Linden, homes sold in August after an average of 81 days on the market. The good news is that the overall trend in Linden is that homes are selling more quickly now than they were two or three years ago, although the improvement is very slow. The bad news is that homes sell slowest, typically, over the winter. Homeowners who want a quick sale have a small window of opportunity in the autumn before risking a longer time on the market. If you are a buyer or a seller interested in a home in Union County, please call Team Zuhl! We’re happy to help you in all of your real estate needs! Clark, New Jersey, is home to nearly 15,000 people in souther Union County. In 2013, New Jersey Monthly magazine ranked Clark as 174th in its rankings of “Best Places To Live” in New Jersey. If you are considering buying or selling a home in Clark, your first step is to understand the real estate market in Clark so that you can make an informed decision regarding how much a house is worth. Sales: Currently there are 87 homes offered for sale in Clark. The trend line for that past 3 years shows a marked decrease in inventory. Since real estate is often a function of supply and demand, this trend shows that more buyers are interested in owning a property in Clark. There were 18 homes sold in Clark in August. The trend line over the past 18 years shows a slight increase in sales which helps to reduce the inventory even further. Prices: The average sale price of a home sold in Clark in August was $479,133. Home prices have been increasing for several years. Again, supply and demand plays a part in this. As more buyers become interested in Clark, Clark home sellers are able to see a larger sale price. Days on Market: People who are selling their house often have anxiety about maintaining their home in show-ready condition. Being constantly ready for a showing is stressful and most home sellers are eager to sell quickly – not only to relieve the anxiety of being on the market, but also to help them get to the next stage in their lives. Therefore, Days on Market can be an indicator of how long an average home will take from the day it is listed until the day it sells. In Clark, homes sold in August after an average of 45 days on the market. The good news is that the overall trend in Clark is that homes are selling more quickly now than they were two or three years ago. The bad news is that homes sell slowest, typically, over the winter. Homeowners who want a quick sale have a small window of opportunity in the autumn before risking a longer time on the market. How Long Will It Take To Sell Your House in Mountainside? If you’re planning on selling your Mountainside home, call Team Zuhl today for a free comparative market analysis of your home. If you’re thinking of buying a home in Mountainside, call us today! How long will it take to sell my house in Scotch Plains? If you’re planning on selling your Scotch Plains home, call Team Zuhl today for a free comparative market analysis of your home. If you’re thinking of buying a home in Scotch Plains, call us today! How long will it take to sell my house in Rahway? If you’re planning on selling your Rahway home, call Team Zuhl today for a free comparative market analysis of your home. If you’re thinking of buying a home in Rahway, call us today! Are you a Rahway Expert? How long will it take to sell my Linden house? How long will it take to sell my Fanwood house? If you are a buyer or a seller interested in a home in Fanwood, please call Team Zuhl! We’re happy to help you in all of your real estate needs!